Lion Corporation (President: Itsuo Hama) announced today the nationwide release of TOP HYGIA on Wednesday, July 18, 2012. This new super-concentrated liquid laundry detergent prevents the growth of bacteria and odors on clothing by enhancing its antibacterial properties2 through washing. This is enabled by a blend of positive-ion antibacterial ingredients and reliable detergency that completely removes the protein-based grime upon which bacteria feed. 1: Prevention concept for laundry: Preventing bacterial growth and odor formation on clothing through detergency and antibacterial capabilities. 2: TOP HYGIA’s antibacterial effect on laundry does not demonstrate enhanced effectiveness against all types of bacteria. According to a 2011 Lion survey, consumer awareness of personal hygiene has increased in recent years, reflecting an increase in the frequency of cases of food poisoning as well as acute gastroenteritis caused by influenza and the norovirus. The survey revealed that personal hygiene practices aimed at preventing illness have become a part of the daily routine of respondents concerned about this issue, particularly mothers with small children. Specifically, 59% of respondents in this group always gargle and wash their hands after returning home, 43% wear surgical masks during influenza outbreaks and 28% always carry antibacterial pre-moistened towellettes when outdoors. Consequently, the hand soap and antibacterial towellette markets have been growing yearly. Among those respondents who value personal hygiene, demand exists for laundry detergents that wash away sebum-based grime (74%), completely remove bacteria (91%) and prevent bacterial growth (90%). Specifically, respondents worry about the “invisible threat” posed by bacteria clinging to laundry. Approximately 1/3 of all housewives surveyed prefer laundry detergents that offer hygienic merit. In response to a growing trend in recent years to wash clothing that has been worn only once even if no grime can be seen, Lion has been promoting research into technologies related to bacteria and the accompanying odors, indicators of the “invisible grime” that is a concern for consumers. As a result, Lion’s Fabric Care Research Laboratories has developed unique antibacterial technology that combines positive-ion antibacterial ingredients with Lion washing technology. The positive-ion antibacterial ingredients adhere to fibers during the washing process and thereby deliver effective sterilization. These ingredients help prevent the growth of the kinds of bacteria that form on towels and undergarments between washings due to such item’s exposure to moisture in the course of normal use. At the same time, Lion washing technology completely removes the protein-based grime upon which bacteria feed. 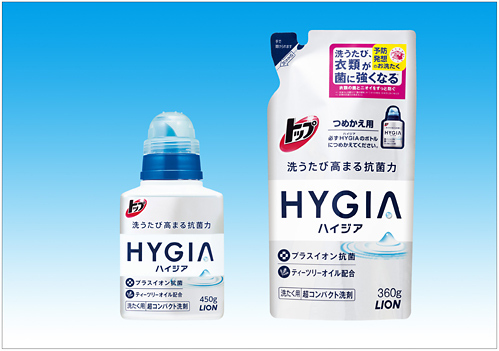 Owing to this research, Lion will release TOP HYGIA, that realizes a new “prevention concept” for laundry. The application of this concept guards against the growth of bacteria and odors on clothing by delivering enhanced antibacterial power and detergency. (1) TOP HYGIA uniquely enhances the antibacterial properties of laundry during washing through positive-ion antibacterial ingredients as well as reliable detergency that completely removes the protein-based grime upon which bacteria feed. Positive-ion antibacterial ingredients adhere to fiber surfaces during washing to deliver enhanced sterilizing performance. 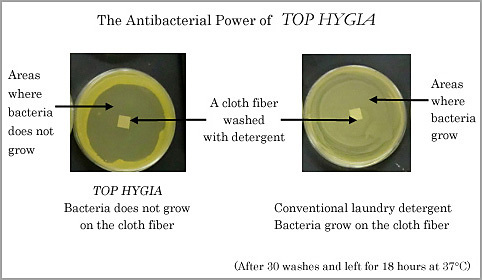 TOP HYGIA also controls the growth of bacteria that remains on laundry after washing thanks to reliable detergency that completely removes protein-based grime embedded in fibers as well as its enhanced antibacterial power. TOP HYGIA is recommended for consumers concerned about towels, undergarments and other items that bacteria easily grows on in damp conditions. TOP HYGIA features superior deodorizing effectiveness against unpleasant odors produced by bacteria and grime. TOP HYGIA is blended with tea tree oil, which features superior sterilizing effectiveness and is well known as a traditional healing remedy3. TOP HYGIA is available in a natural peppermint-spearmint fragrance that leaves laundry smelling refreshingly clean. Featuring effective foam dissipation that leaves a minimal amount of detergent residue on clothing, TOP HYGIA requires only one rinse cycle, leading to greater water and electricity savings.